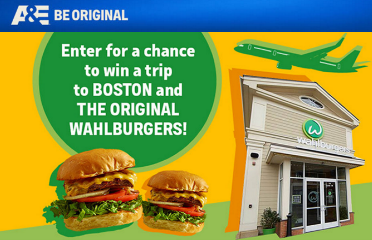 A&E’s Trip to the Wahlburgers Sweepstakes – Win a trip to Boston! Win a trip to Boston! ENTER SWEEPSTAKES HERE – Wahlburgers on A&E Facebook page. ENTRY LIMIT – There is a limit of one (1) Entry per person per day, of the Sweepstakes, throughout the Sweepstakes Period. ELIGIBILITY – A&E’s Trip to the Wahlburgers Sweepstakes is open to legal residents of the fifty (50) United States (including the District of Columbia), who are at least eighteen (18) years of age, or the age of majority in their jurisdiction of residence, whichever is greater, at the time of entry. SWEEPSTAKES ENTRY PERIOD – The Sweepstakes commences at 12:00:00 PM Eastern Time (“ET”) on March 16, 2016 and ends at 11:59:59 PM ET on April 6, 2016. P.F. 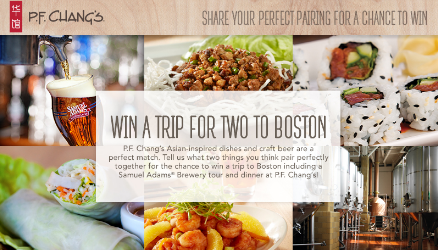 Chang’s China Bistro Perfect Pairings Contest – Win a trip to Boston! ELIGIBILITY – The person entering the contest must be 21 years of age or older at the time of entry. Entrants also must be U.S. citizens that are able to attend a Craft Beer & Food Experience in the Boston metro area. Age verification required of all Entrants and Entrants not meeting these criteria will be disqualified. SWEEPSTAKES PERIOD –The registration period begins at 12:00 AM PT on July 11, 2014 and ends at 11:59 PM PT on August 31, 2014. PRIZES –GRAND PRIZE AND SECOND PRIZES: GRAND PRIZE: One (1) Grand Prize Winner will receive the Sam Adam’s Brewery Tour (led by a Brew Master) for the Grand Prize Winner and a guest and also a Craft Beer & Food Pairing Experience (a free 4-course craft beer and food pairing dinner for two at a Boston area P.F. Chang’s restaurant.) Grand Prize Winner will receive airfare for two (2) and two (2) nights of accommodations at a hotel in the Boston area selected by Sponsor at which time during that trip they are to receive their Tour and Craft Beer & Food Pairing Experience. Grand Prize is non-negotiable and non-transferable. Grand Prize Winner must commit to a Tour date and Craft Beer & Food Pairing Experience Date by October 1, 2014. The Tour and Craft Beer & Food Pairing Experience must occur before December 1, 2014. Craft Beer & Food Pairing Experience and Tour dates are limited to Monday through Thursday. Sponsor will communicate with Grand Prize Winner via phone and/or email to finalize the details of the Tour and Craft Beer & Food Pairing Experience. SECOND PRIZES: Twenty-Five (25) second prize winners will each receive $100 P.F. Chang’s gift cards. To be eligible for a chance to win a second prize, an Entrant must share the Contest via social media (Facebook, Twitter, Instagram or Pinterest) with at least two (2) friends. Second prize winners will be chosen at random by Sponsor from a pool of all eligible Entrants on or about September 12, 2014. Irish Spring St. Patrick’s Day Sweepstakes – Win a trip for 2! 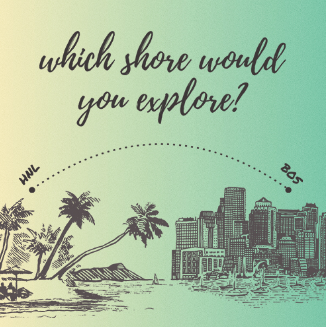 Win a trip for two to your choice of Boston, NYC or Chicago! ENTER SWEEPSTAKES HERE – Irish Spring Sweepstakes page. You will need a UPC code to enter. ELIGIBILITY – Irish Spring® St. Patrick’s Day Sweepstakes is open only to legal residents of the fifty (50) United States and the District of Columbia who are at least eighteen (18) years old at the time of entry. SWEEPSTAKES PERIOD – The Sweepstakes begins on February 23, 2014 at 12:00 a.m. Eastern Time (“ET”) and ends on March 29, 2014 at 11:59 p.m. ET. PRIZES – ONE (1) GRAND PRIZE: A trip for two (2) to winner’s choice of Boston, MA; New York, NY; or Chicago, IL for the St. Patrick’s Day weekend celebration in 2015. Trip package includes round-trip coach-class air transportation for two (2) from an airport near winner’s home (determined by Sponsor in its sole discretion) to an airport near the selected city; two (2) nights’ accommodations at a hotel determined by Sponsor in its sole discretion (single room, double occupancy); ground transportation between hotel and airport; and $1,000 that can be used toward taxes. Winner must travel on dates determined by Sponsor in its sole discretion or prize will be forfeited. Approximate Retail Value (“ARV”): $5,000.